Former Azusa Pacific wide receiver Dave Canales ’02, assistant quarterbacks and offensive quality control coach for the Seattle Seahawks, became the first Cougar to participate in a Super Bowl when Seattle defeated the Denver Broncos in Super Bowl XLVIII at MetLife Stadium in East Rutherford, New Jersey. 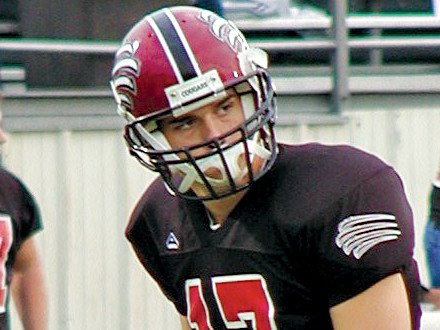 Canales played four seasons at APU and posted career totals of 27 catches for 293 yards and one touchdown. Now in his fourth season with Seattle, he and his wife, Elizabeth (Henderson ’05), whom he met in a Bible study at APU, live with their two children, Ashby and Benjamin. APU LIFE: How did you become an NFL coach? CANALES: During the three years I coached at El Camino College, I established a relationship with Steve Sarkisian at the University of Southern California and worked their summer football camps. In 2009, they offered me a video assistant position. After that season, Pete Carroll took the Seahawks job and invited me to join him in Seattle. APU LIFE: Describe your typical day. CANALES: Along with two other assistants, we set up practices, make the pass and run drawings, evaluate the practice cards for our scout team, review plays, watch film of the opponent, and talk about issues that require attention. During practice, we help keep things moving and motivate the team. On game days, I chart our offensive play calls and break down special situations. APU LIFE: How does coaching at this level differ from college? CANALES: My very first NFL training camp, I went to practice missing several practice cards. We didn’t have enough to finish a period, so practice stopped because of me. That was really embarrassing and the pivotal point when I realized the magnitude of the Seahawks machine. If one cog is out of place, the whole machine stops. In high school or college, we could just skip something and move on to the next thing, but in the NFL, every single play is important. It made me realize how much detail and energy goes into each day at this level. APU LIFE: What lessons did you learn at Azusa Pacific that you apply to your coaching career? CANALES: I learned to treat people with respect, and that meant everybody in the building. That was an expectation at APU. In addition to the tough side of the team, there was also a gentle side, and I’ve carried that through my coaching career. I want my players to be tough and hate losing, but I also want them to be considerate and courteous. Coach Peter Shinnick created an awesome team and an amazing environment of love, support, and respect. I’ll never forget what he shared with us after we had flown back from a game. One of the flight attendants wrote him a letter, saying we were the most courteous, thoughtful, and kind sports group she had encountered in 30 years of flying, and Coach Shinnick got emotional about it. Those types of things stuck with me, and that’s the reason I coach. Those are the poignant moments of my career, knowing the impact my head coach made on me, and he affected the way we treated others. I learned how to put God first for my family, my career, and my professional development. It might not be popular to stand for the things we believe in, but it’s the one thing that has shaped and molded my life. That’s the lasting mark that I got from Azusa Pacific, that you can achieve excellence in all you do while serving the Lord. APU LIFE: What’s next for your career? CANALES: In the next four years, I hope I have an opportunity to become a position coach. It would be exciting to have a position of my own, to coach quarterbacks or wide receivers in the NFL, and contribute in that way. 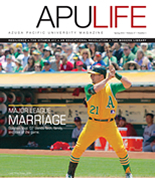 Originally published in the Spring '14 issue of APU Life. Download the PDF or view all issues.